Notes: Saltley Station was located on the Birmingham and Derby Junction Railway (B&DJR) Tame valley line that opened as a double-track route between Water Orton and Birmingham Lawley Street on 10 February 1842. The B&DJR opened a railway between Derby and a junction with the London & Birmingham (L&B) at Hampton in Arden on 12 August 1839. From Hampton the B&DJR trains had to travel over the L&B to reach Birmingham, which caused considerable expense. The Tame valley line gave the B&DJR their own route into the city where they opened their own terminus at Birmingham Lawley Street. The original station at Saltley was constructed by the Midland Railway (MR) in 1854 opening on 1 October. Two through platforms were provided, an ‘up’ and a ‘down’ either side of the double-track railway. The up platform extended across the Warwick Junction extension of the Grand Union Canal and also formed a bay platform some way to the north of the station. Access to the station was provided from either side of the level crossing which was directly to the south of the station. A waiting room and booking office were provided on the up side (Derby direction) with just a waiting room provided on the down side (Birmingham direction). No goods facilities were provided at the station due to its close proximity to the Lawley Street goods depot. In around 1887 the Saltley Viaduct was constructed to replace the level crossing and access was provided to the station via two sets of steps directly from the pathway on the viaduct. In 1899 the station was demolished in conjunction with the widening of the line by the MR, and a single island platform in the centre of the main up and down passenger lines replaced it. The platform was reached by steps through one of the original apertures built into the Saltley Viaduct, which originally provided access to the down platform. The platform building was entirely of timber construction, of a style found scattered around the Midland Railway network wherever widenings and new works were undertaken between the 1880s and 1910: similar structures were at nearby Water Orton, but they were found as far afield as Cricklewood (Middlesex), Swinton (Yorkshire) and Stroud (Gloucestershire). The building was functional with a flat roof and minimal decoration. However a flat awning of generous proportions, carried on brackets, extended to the two platform edges and a short distance beyond the building on the other two sides, and a fairly deep valance with crenellations and circular piercings added a little distinction. The station enjoyed a healthy level of service with the July 1922 Bradshaw showing 16 up and down services on Monday to Saturday, with six services on a Sunday. Most of the services which called at Saltley in 1922 were local trains to Derby or Walsall, but there were direct trains to Bradford and a single Derby to Plymouth/Bournemouth service which called there in both directions. Many of the patrons would have been workers travelling to and from the many local factories as well as shoppers wishing to travel into Birmingham. At the railway grouping of 1 January 1923 the Midland Railway was absorbed into the London Midland & Scottish Railway (LMS). The timetable from the final year of the LMS in 1947 shows several services which echoed from the MR days. One of the most interesting was the Sunday 1.10am departure from Bristol Temple Meads calling at Saltley at 7.16am, finally reaching its destination of London St Pancras at 11.50am: certainly a circuitous route. On 1 January 1948 Saltley became part of British Railways London Midland Region. Following Nationalisation the through services calling at Saltley greatly diminished and destinations such as London St Pancras, Glasgow St Enoch and Liverpool Central required a change of train. The summer 1956 timetable shows a slight improvement with 20 down services on Monday to Friday, 21 services on a Saturday - the additional service was to Paignton - and seven services on a Sunday with one service to Weston-super-Mare; strangely there was no return service calling at Saltley. In the up direction there were 16 services on Monday to Friday with 18 on a Saturday - one being to Bournemouth - and seven on a Sunday. By the early 1960s the station was suffering from omnibus competition and, with car ownership increasing, more people were holidaying using their own vehicle. The station was becoming increasingly run down, and although BR(LM) vitreous enamel running-in nameboards and totem name signs were installed, probably in the late 1950s, gas lighting was retained. The Reshaping of British Railways (‘Beeching’) report of 1963 recommended the withdrawal of all stopping services between Birmingham and Derby and the closure of the stations at which they called. Despite the identification of this route for closure Saltley was, surprisingly, not named in the list of stations to be closed – presumably an error. On 9 September 1964 formal notice was published of the proposal to withdraw Derby – Tamworth – Birmingham local trains, but it took until 16 August 1967 for Barbara Castle, Secretary of State for Transport to give her approval, reprieving one of the stations. 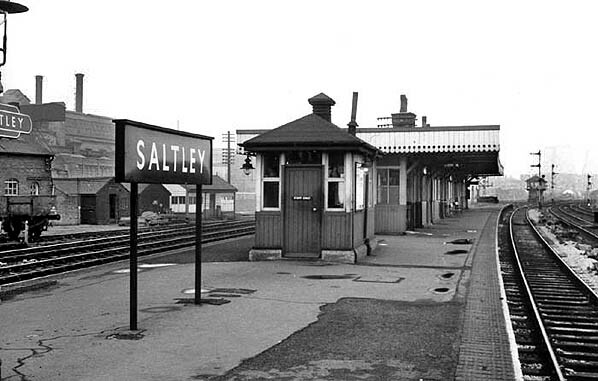 Saltley closed to passenger services on 4 March 1968, together with neighbouring Castle Bromwich station. Saltley station was soon demolished, and today there is little evidence that there ever was a station here apart from the swathe of land in the centre of the running lines on which the 1899 island platform stood. The two bricked-up entrances from the Saltley Viaduct are evident upon closer inspection. The Birmingham to Derby line still runs through the site and, with the Freightliner terminal located on the site of Lawley Street goods depot, the area is still busy with both freight and passenger services. The lines running through the station site comprise up and down passenger and up and down goods, and they carry a large amount of traffic. 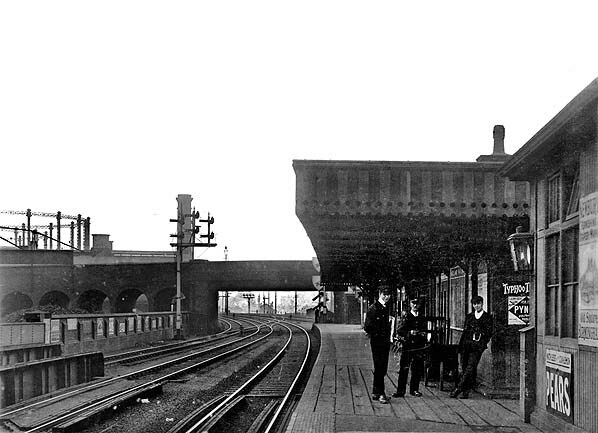 Looking south-west along the down platform at Saltley station in 1908. Saltley station in its original form shown on a 1:500 scale 1889 town plan. Saltley station following the rebuilding and widening of 1899 shown on a 1:2500 scale 1917 map. 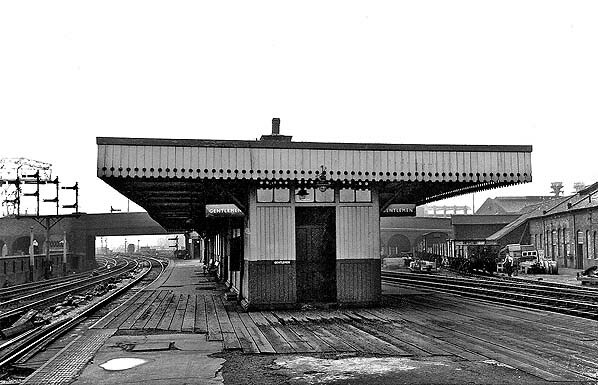 The main platform building at Saltley station looking in the down direction in October 1951. The building seen in the foreground of the 1908 picture had been demolished by this time. 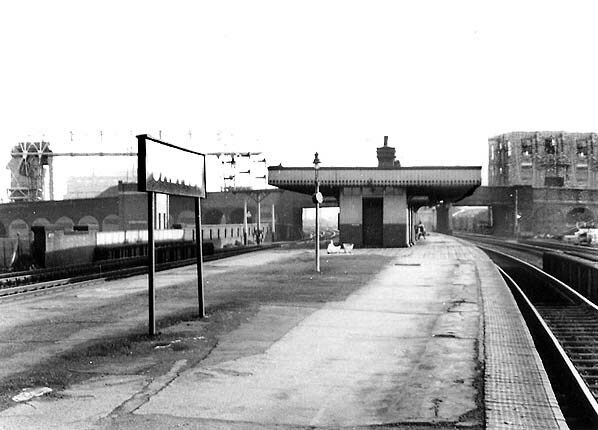 Saltley station looking north-east along the down platform in the 1960's. 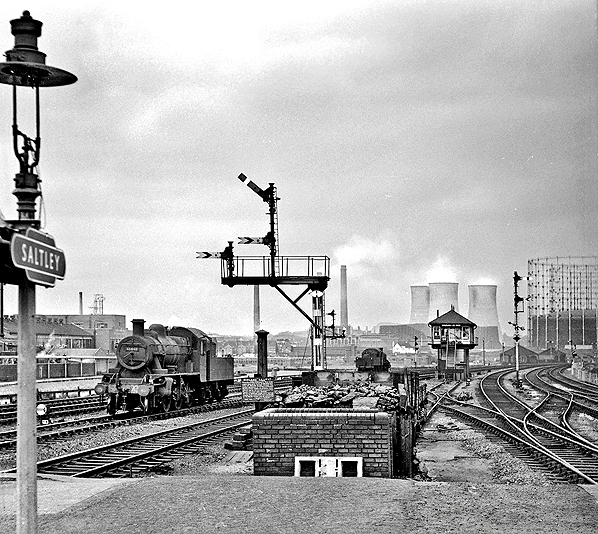 Looking south-west along the up platform at Saltley station in the 1960's. The view from the north end of the island platform at Saltley station in July 1964. In the distance is the Saltley Sidings signal box which closed in 1969 with the opening of Saltley power box. Beyond the box is Nechells power station and to the right the gasometers of the Washwood Heath gas holder station. An ex-LMS bulit Ivatt 2-6-0 locomotive has just passed the station en route to Washwood Heath yard. The site of Saltley station in December 2013 seen from the Saltley viaduct looking towards Derby. The swathe of land in the centre of the lines marks the site of the island platform from the 1899 rebuilding.